What services can boaters expect during the government shutdown? SAN DIEGO — If common sense prevails, the federal government will have re-opened when you read this. As of this writing a few cracks in opponents’ positions are appearing. Based on my experience of many Washington stand-offs, even after the government reopens more shutdowns are likely in the current polarized political environment. Nine government departments, plus several smaller agencies, are closed, with only “essential services” continuing. The agencies providing services most directly impacting boaters are the U.S. Coast Guard and Customs and Border Protection, which both became part of the Department of Homeland Security, the department central to disputes over Trump’s proposed border wall, following the 9/11 attacks. The Interior Department operates national parks many boaters visit. To learn what USCG services are affected, I called its Washington, D.C. headquarters and spoke with Public Affairs Officer Lt. Amy Midgett. “Uniformed (USCG) personnel will continue to perform essential services such as search and rescue, port and homeland safety and security, law enforcement and environmental response,” she explained. Merchant mariners or recreational boaters awaiting their USCG licenses must wait until the government reopens. Fisheries enforcement patrols are on hold, as is routine maintenance of navigational aids. But if buoys drift from their normal positions or their lighting fails, the Coast Guard will respond as a safety issue. Although Lt. Midgett assured me they have access to funding to fuel their vessels and aircraft, in the past lack of fuel funding affected readiness and their ability to operate their vessels. Most civilian “non-essential” USCG personnel are furloughed. Neither uniformed nor civilian personnel are being paid, even if working. It’s unclear if, post-shutdown, Congress will authorize money for back pay. Is this the way we want to treat our public servants? Morale is already plummeting amid workers’ worries concerning their ability to support their families and pay their bills, affecting retention of good workers. Customs and Border Protection and other border-related law enforcement personnel are also working unpaid. CBP continues to process border crossers and still responds when called to inspect a boat arriving from foreign waters. But inspection delays may be greater than usual with fewer workers. Since the government shutdown Arv and I have twice crossed the border into Tijuana at the San Ysidro pedestrian crossing and observed no apparent change in service. What we saw, as we note every time we cross, is ever-increasing border fortification. Since the media doesn’t report it, if you don’t live near the border or cross regularly you probably don’t know there’s already a triple-layer border barrier, now topped with ornamental concertina wire, apparently installed as make-work for Trump’s troops’ border deployment. Let me stress: there is nothing approaching a “national emergency” at the border, just a manufactured crisis for political gain. The border is not “open” at all, but heavily barricaded and controlled by law enforcement. 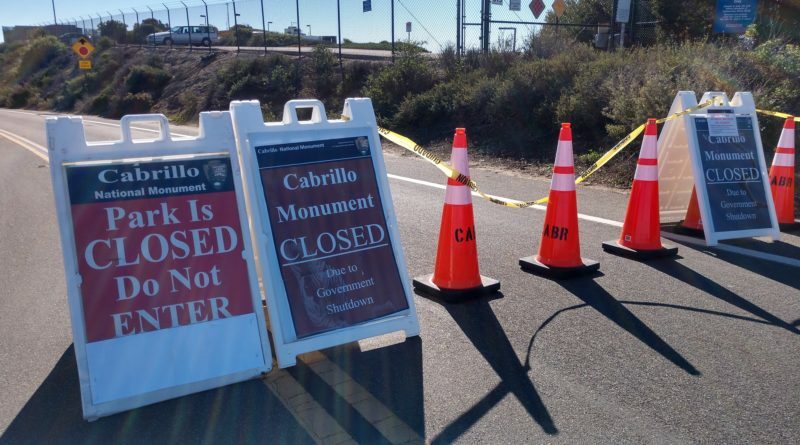 National parks, including Cabrillo National Monument and Channel Islands National Park, popular with boating visitors to San Diego and Ventura, are now shuttered, their staffs furloughed. If you care about restoring our federal government to full functionality, please call your representative and senators – and the White House – and tell them to end the shutdown – now. I’m glad the truth is told: “Let me stress: there is nothing approaching a “national emergency” at the border, just a manufactured crisis for political gain.” Thank you, Capt. Larsen and the Log for running this important news. Where can I get some of that koolaid. Since when did Captain Larson become an expert on border security. I teach typing in Astoria and I can assure you the sandbar at the Columbia is safe to cross. Her bio does not say anything about her expertise or service to any branch of the governmet, military. Gosh. The Great Wall of China worked for 2000 years. Hmmmm. Stick to the dock lines Captain. Or show some proof of what you speak. Not in my beloved Log. I am surprised that the Log is letting writers display political opinions but in this case I would like to thank Captain Larson. She expressed the finding of her trip to Tijuana, “the triple layer border barrier, now topped with ornamental consertina wire”. She also went on to observe that there is “no national emergency” nor are our borders “open”. Thank you Captain Larson for supporting the “wall” or “barrier” at our border from those of us who live right across the USA border. Please speak for us to Congress and show them like you said in the Log, to please secure the other 680 miles plus of unsecured border. Be our voice Captain Larson, especially in the LOG!